For a number of years I have been using madder (Rubia cordifolia) sourced from Maiwa (in Vancouver, BC almost exclusively for my dyeing. I particularly appreciate the fact that it is finely ground so that I am usually able to just put the dye into the bath along with my textile. If dyeing yarn, however, I typically will place the ground dye into a net bag to keep small particles of madder from physically attaching to the fibers. I once heard Michel Garcia speak about the fact that you can nearly double the yield from madder root if it is finely ground. It makes sense. More surface area means that it’s easier to extract the dye. I cleaned and dried the roots. Some of the dyes are developed by in the drying process so that is important. A few weeks later, I dug up another small patch. With this second batch, it occurred to me that maybe I could grind up the roots before drying them. It was easy to chop up the fresh roots into small pieces with an old food processor that I have designated for studio use. Once chopped, the roots dried very easily on horizontal screens. Last month, I was preparing a major piece for an exhibition and I wanted to use my own madder. The large, dried roots proved to be problematic. I wanted to grind them as fine as possible but was not sure how to proceed. I tried a mechanical corn grinder. It was a terrible experience! The grind was very coarse, the roots jammed in the grinder, and it was not at all successful. I tried the old food processor – not powerful enough to be effective. I even tried grinding small amounts in a dye-designated coffee/spice grinder. It was better, but still not very good and it would have taken far too long since the capacity of the grinder was very small. Corn grinder was not an efficient way to grind madder roots. I did some research, and finally decided to purchase a powerful electric grinder that is recommended for medicinal herbs (roots) etc. It was amazing! First, I quickly broke the roots into smaller pieces by hand, which allowed me to pull out the “chaff” (the stem pieces with no dye). I put the smaller root pieces into the grinder and I had finely ground madder root in just two minutes! I’ve learned a lot (of course). Madder root, even when dried completely, still has elements (sugars maybe?) that coated the bowl of the grinder with a layer of sticky madder. The bowl of the new grinder cannot be immersed in water so I had to work hard to clean it out. But the madder is all ground and the grinder is now ready to grind my dried sumac leaves and some other tannins. 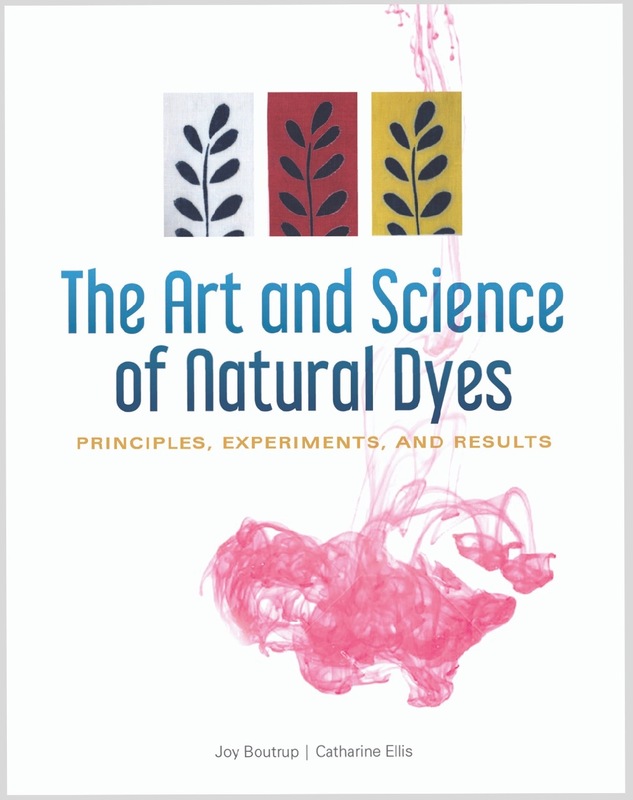 In our book, The Art and Science of Natural Dyes, Joy and I discuss and show examples of how a dyer sometimes has more control over the color when using madder roots rather than extracts. The source (and type) of the roots is also a factor. Madder contains many different dyes and the two different species contain different combinations. As I began my tests for the exhibition piece, I did many samples and used madder roots from a variety of sources. The woven shibori project utilized mordant printing with different strengths of aluminum acetate, ferrous acetate, and combinations of the two mordants. When Rubia tinctorium is used with iron mordants, it is possible to achieve distinct purple colors. The purples are not possible with Rubia cordifolia, as the dyes within the roots are different. I was very happy to observe that my own madder was the very best of all! Ground madder root @ 50% w.o.f. on cotton with mordant printing. Left to right: Rubia tinctorium from my garden, Rubia tinctorium from France, Rubia cordifolia from India (Maiwa). Note the purples achieved from the Rubia tinctorium with an iron mordant. I am very encouraged to keep growing…and dyeing…. I have begun using my own copy of The Art and Science of Natural Dyes in the studio and in my teaching. No, I do not have all of those recipes committed to memory! I have found it very useful to add tabs to the book, making it easy to navigate and find exactly what I’m looking for. Note: Maiwa now carries very finely ground Rubia tinctorium roots. Where is YOUR Indigo Grown? I first met Sarah Bellos of Stony Creek Colors in 2016 when she spoke at the Growing Color Symposium at the NC Arboretum in Asheville. She presented her vision for growing and extracting indigo in Tennessee. Her goal was to introduce natural indigo to the denim industry, which is currently a huge consumer of synthetic indigo (a serious source of environmental pollution). She was partnering with Tennessee farmers who had previously grown tobacco and planned to process indigo dye locally. I must admit that I was somewhat skeptical. The project seemed too big and too optimistic. I didn’t know anyone who had successfully grown indigo dye plants on the scale that she described. Most dye plants are grown for commercial purposes in India or South America, where the price of labor is far less. Indigo was grown in the Southeast coastal regions of South Carolina and Georgia in the 17th and 18th centuries but, to my knowledge, has not been grown commercially in North America since that time. On a recent visit to Stony Creek near Nashville, TN I was very pleasantly surprised and now believe that they are truly on the way to something successful and very much needed. I’d like to tell you why I believe this. The first place visited was the “test farm”. I had envisioned a small plot of Persicaria tinctoria but was amazed to find that the test farm was a densely planted, multiple acre farm tract where several strains of Persicaria tinctoria are growing next to the tropical varieties of indigo (Indigofera suffruticosa and Indigofera tinctoria). Why grow so many different types of plants? Sarah and her staff are constantly asking questions and testing: Which varieties can be sown directly in the ground? Which need to be started in the greenhouse? Some strains bloom more readily than others (great for seed production but not so good for indigo production). Which plants can be dried for future extraction? What is the indigotin content vs. the biomass of the plants? Which can be harvested most efficiently? I believe that the Stony Creek team is concluding that there is wisdom in growing more than one variety of indigo. The farmers are currently growing many acres of indigo for pigment extraction. All farms are within a reasonable drive to the factory, as it is necessary to process the indigo leaves quickly. The next stop was Stony Creek’s lab. Walking in the door I saw that the dye chemist, Summer Arrowood, was pulling leaves from Persicaria tinctoria stems that had been harvested earlier that morning. She was weighing those leaves and recording the leaf-to-stem ratio. Next, individual bags of leaves (from very specific plants in very carefully identified locations at the test farm) were processed to extract the indigo pigment. I sensed that this was part of each day’s work at the lab. The leaves were soaked in hot water, the liquid was pumped into vessels for aeration, the paste was allowed to settle and then filtered. Several hours later, each batch of leaves had produced a small amount of indigo pigment. These were tested, labelled and stored for future reference. They report that their indigo contains 25-35% indigotin which is a very concentrated output. Vessels for test extractions of pigment. Sarah is holding the piping used for introducing oxygen into the indigo extraction in order to precipitate the pigment. Yoshiko Wada, and Summer Arrowood, Stony Creek’s dye chemist, observing the results of TLC, (thin layer chromatography), used to determine whether indigo pigment samples that Yoshiko brought were natural or synthetic. Stony Creek is experimenting with extraction from dried plant material in order to extend the production season. The production factory is located in a county-owned, former tobacco factory and leased by Stony Creek. Here, 20,000 pounds of indigo plant material can be processed in a single batch. The factory is set up with modern equipment, carefully laid out, and efficient. Stony Creek precipitates indigo pigment without the use of lime (calcium hydroxide). When too much lime is used during the process, it will remain in the indigo pigment and skew the weight of any available indigotin. The extraction without lime is one of the reasons the pigment has such high levels of indigotin. The pigment paste is carefully filtered using processes that Stony Creek has developed specifically for indigo. Truck trailers used for indigo harvest and initial steeping of plants. Water that has been collected from the root and heated in solar tanks is used for extracting the indigo. Stainless tanks are used for aerating the indigo. Stony Creek has recently installed two additional tanks. Plastic tanks are used for settling of the indigo paste. All indigo paste settles to the very bottom of the tanks. The remainder is waste water, that is properly neutralized before discarding. How has Stony Creek come this far so quickly? Sarah Bellos has an academic background and experience in natural resources management and sustainable agriculture. She is a self-taught natural dyer; she and her sisters operated a dye business for several years under the name Artisan Natural Dyeworks. Stony Creek employs skilled and smart people, who know chemistry, plants, agriculture, and manufacturing. The farmers, who grow the indigo, are benefiting from a cash crop that has the potential to replace the tobacco that grew here for so long. Stony Creek is currently selling indigo paste to denim producers and they are able to test/replicate the warp dyeing process used by the denim industry in their lab. Sarah had a vision to produce natural indigo and they are making it a reality. At a time when some of us are unsure if we are purchasing natural indigo or synthetic indigo (or a mix of both) Stony Creek is a beacon of light. I have used their indigo and it is excellent. Of course I will purchase my indigo from them! I will encourage other dyers to do the same. Stony Creek is NOT yet set up for visitors. Right now, they need to focus on the work at hand and continue to develop their current products: indigo, black walnut paste extract (that really works! ), and a madder extract paste (currently from Rubia tinctorium roots grown in India until their own roots are ready for harvest). After this year’s indigo harvest they plan to move the lab to the factory location and at some time in the future will be able to offer workshops onsite. I hope that you will consider helping to grow this promising endeavor by trying out their excellent indigo, and other extracts available for order online at their website. Other dye suppliers are also beginning to carry and sell Stony Creek Indigo. The day we visited the factory, there was no indigo being processed. It had rained the day before and the indigo plants cannot be harvested when wet; this whole process is tied closely to the land. Before we left in the afternoon, the truck and trailer had left for the fields, ready to be loaded with indigo plants early the next morning. 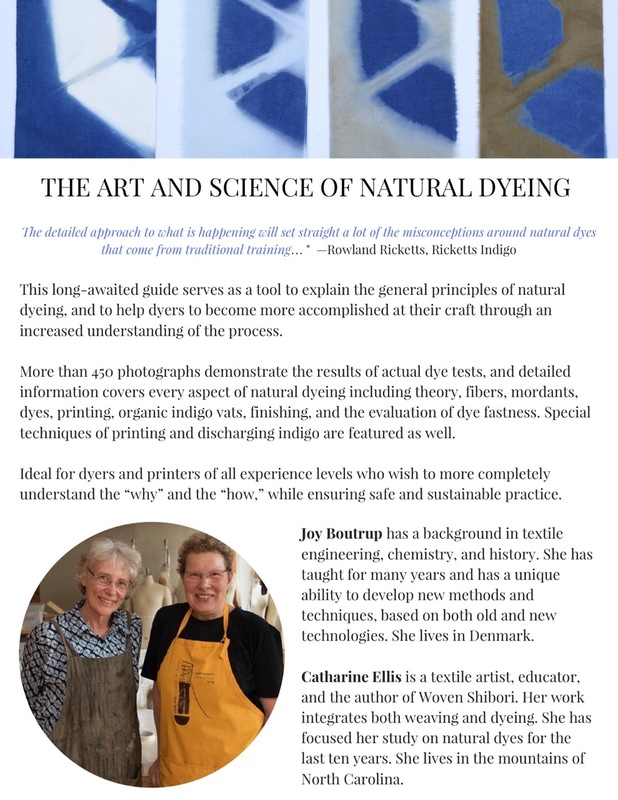 Yesterday I received a phone call from Schiffer Publications – the publisher of Joy’s and my upcoming natural dye book. I am sorry to report that the release date, originally projected for the end of October, has been delayed until late January. Schiffer is taking great pains to be sure that all color reproduction is exact and precise. The book is illustrated with photos of actual samples from my dye tests. Our goal was to share some of the hundreds of samples that I have done, comparing the use of different mordants, tannins, dye treatments, times in the dyebath, etc. Many of the variations are subtle – but the differences are important. Careful color adjustments have been made to the digital images in Art & Science of Natural Dye to ensure that the dye colors reproduce as accurately as possible through the print process. Color proofs are reviewed and compared to the actual dye samples as part of this process. Yes, it will be delayed, but the color will be the best possible printed reproduction and I’m very happy about that. It’s good to be working with a publisher that really cares about these “small” details – they are really not small at all. Below is just a small hint of what will be included. I know that many of you have pre-ordered the book and are anxiously awaiting it. Joy and I appreciate the vote of confidence and are sorry for the delay. Yesterday, on a long drive back home from New England, I finally had the chance to listen to a lecture given by Michel Garcia and available as a Maiwa Podcast. It’s title is Field Notes in the Color Garden, parts 1 & 2. It’s a long, wonderful, rambling lecture that Michel gave in 2015 and Maiwa uploaded as a podcast this year. It has given me much to think about in regards to dye plants, resource books, investigation, and the human scale of natural dye. It’s still less than a year since Joy and I turned in the manuscript and images to the publisher. My learning has not stopped and once the book is released, I look forward to sharing some of the things I’ve continued to work on and learn about since we sent the manuscript away. “Stay tuned”. Are All Oak Galls Equal? The short answer is “no” but here is the longer answer. I’ve used Aleppo galls (either ground or extract) for years as my preferred tannin. They were recommended to me as being high in tannin and are readily available. Gall is a source of colorless, gallic tannin. I’ve done many tests comparing the Aleppo gall to tannins, such as sumac (from local leaves), myrobalan, tea, and many others but I had never compared different varieties of oak galls. First of all, what is an oak gall? They are sometimes called “oak apples” and are small, round growths of plant tissue produced by the oak tree in response to the infestation and larvae of a wasp. There are many different species of wasps as well as oak trees. As a result, the galls from each of these is different. The Aleppo gall nut (Quercus infectoria) is hard and dense but can be ground to produce fine particles. A friend from Missouri gave me a jar of her local gall nuts. She lives in a forest of white oak (Quercus alba) and gathers the galls when they fall to the ground. These galls have a smoother surface than the Aleppo but are just as hard and dense. Recently I was in New England and was able to gather galls from the scarlet oak variety (Quercus cocinea). These are larger, very light in weight, and seemingly hollow. As a child, we referred to them as “puff balls”. I wanted to know something about the tannin quantity of these various galls and if they could be used interchangeably for dyeing applications. They were applied to cotton fabric prior to mordant and dye. I used each of the tannins at 10% weight of fiber, which is the standard amount I use of gall nut extract. The whole galls were ground with a small spice grinder, and further crushed using a mortar and pestle. Those from the White and Aleppo oaks broke down into fine granules, while the Scarlet oak variety was impossible to grind as fine, as the insides were truly “puffy” and “spongy”. Each of the ground gall varieties and the extract were put into warm water, using separate beakers for each, along with the cotton cloth. They sat at room temperature for 1 hour before the mordant was applied. I took a portion of the samples with the tannin application and put them into a weak iron bath. When tannin and iron combine a dark grey or black will result. The shade of grey is an indication of the amount of tannin present. The Aleppo gall nuts, in either the ground or extract form, resulted in much deeper shades of grey than either the white or the red oak varieties. The large pieces from the scarlet oak resulted in a very uneven application of tannin. When the iron was applied, the surface was very splotchy and irregular. TOP: Tannin only. Although the galls appear to have colorants, an insignificant amount of color attached to the textile. MIDDLE: with weak iron applicaton. BOTTOM: sample shows the uneven application of the scarlet oak gall. The rest of the samples were then mordanted and subsequently dyed with both weld and madder. The amount of tannin has a direct effect on the amount of mordant that can attach to the textile, and the depth of dye color obtained is a direct reflection of the amount of mordant present. Based on the iron applications, I was surprised at the depth of the color obtained with all of the gall varieties. Although the dye color obtained from the white and scarlet oaks is lighter than the Aleppo, there is still significant color attached. When using tannin prior to mordanting, it is likely that increasing the amount of gall from the white or scarlet oaks would increase the amount of mordant that attaches and thus the depth of dye color. Locally harvested galls, when available, are an opportunity to use the local resources and achieve acceptable results. A life of natural dyeing knows no bounds. Each year I am thrilled and delighted to increase my knowledge and understanding of dyes and process. This year, I was privileged to participate in the harvesting of indigo and the extraction of pigment on the island of Okinawa, Japan. The Okinawa farm has been producing indigo for many years, as evidenced by the large, round concert vessels imbedded in the ground. The vessels are used for extraction of pigment. Smaller square vessels, also in the ground, are used for the storage of the indigo paste pigment. The indigo harvest and extraction is currently being done by a young couple, Takashi and Kitta Sawano. They have been extracting pigment here since 2012. He is a dyer. She designs and makes beautiful, naturally dyed cotton garments in a studio located in northern Okinawa. The process of harvest and extraction requires many helping hands and there were a number of friends and artisans who came to get their hands dirty and participate. The variety of indigo is Strobilanthes cusia. It looks similar to polygonum tinctorium but this variety requires a hotter climate and has a greater content of indigotin. Even the stems of the plants contain indigo. Eight different harvests are made during the summer season to extract pigment from all the indigo plants. It was pouring rain the morning we arrived to harvest. I was given a small scythe and some white ropes. I felt somewhat prepared for the cutting and tying process since this is the same approach that we used last summer when harvesting Polygonum tinctorium at Rowland Ricketts studio/farm. Everything else about the process was different, since Rowland uses his indigo to compost the leaves for sukumo. The goal was to collect 400 kilos of indigo plant (leaves and stems). Each bundle was weighed and the weight of the wet leaves was taken into consideration. The plants were then tossed into one of the large round vessels that was already filled with water. A porous round tarp had been placed over the surface and the plants went on top of that. The indigo plants were weighted down with wire mesh, boards and rocks to ensure full immersion. The plants were left to soak for the next 24 hours. On the next day, we observed that some fermentation was beginning and measured the pH. On the the third day, the fermentation was very active. The plant material was lifted out of the vessel (with the help of a small tractor). Lime was added. The amount of lime was carefully calculated as too much lime will result in an inferior pigment. The indigo extraction was aerated for 45 minutes using long rods with a small paddle affixed to the end. The shape of the vessel made this a very efficient operation. The introduction of oxygen through aeration caused the indigo pigment to precipitate to the bottom of the vessel. Once the excess water was pumped off the surface, the paste pigment could be pumped into a storage container, where a more concentrated pigment will settle to the bottom over the next few weeks. I purchase indigo for use in my own dye vats. Most of it has come from India but I am currently using indigo grown right here in the U.S. at Stoney Creek Colors. This experience has given me a new appreciation and understanding of the cycle “grow, extract, dye” and a deep respect for those who participate in the entire process. My thanks go to Hisako SUMI, who has participated in this indigo harvest for the last number of years and invited me to attend – in the spirit of understanding and sharing.